Physician and philologist of the seventeenth century, who in his Latin work on medicine calls himself Dionysius; born about 1606, probably in Spain; died at Amsterdam in 1675. In his earlier years he practised medicine at Hamburg, where his wife died in 1634, six years after their marriage. In memory of her he wrote his first work, "Zeker Rab" (Amsterdam, 1635; 2d ed., with Latin interlinear translation, Hamburg, 1638). In 1640 his "Sacro-Medicæ Sententiæ ex Bibliis" appeared at Hamburg, together with a letter on alchemy entitled "Me Zahab." A work on the ebb and flow of the tide, published two years later, was dedicated to King Christian IV. of Denmark (d. 1648), who appointed him his physician in ordinary, Mussafia living in this capacity at Glückstadt, Holstein. The polemic treatise of Senior Müller, a pastor of Hamburg, entitled "Judaismus oder Judenthum," published at Hamburg in 1644, alludes, although without mentioning his name, to Mussafia's attacks on representatives of the Christian religion (see Grätz, "Gesch." x. 24). Ten years later Mussafia records, as an incident of his sojourn at the Danish court, a conversation with the king and his courtiers concerning dolphins represented as sirens (see his "Musaf he-'Aruk," s.v. , ed. Kohut, vi. 139b). 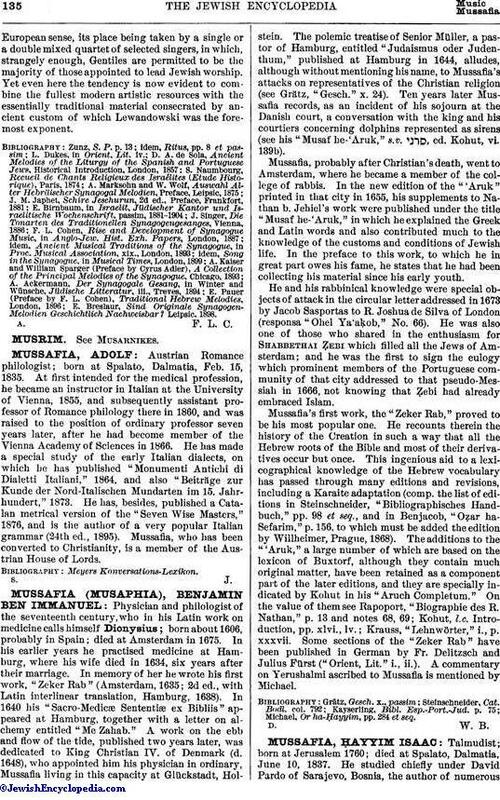 Mussafia, probably after Christian's death, went to Amsterdam, where he became a member of the college of rabbis. In the new edition of the "'Aruk" printed in that city in 1655, his supplements to Nathan b. Jehiel's work were published under the title "Musaf he-'Aruk," in which he explained the Greek and Latin words and also contributed much to the knowledge of the customs and conditions of Jewish life. In the preface to this work, to which he in great part owes his fame, he states that he had been collecting his material since his early youth. He and his rabbinical knowledge were special objects of attack in the circular letter addressed in 1673 by Jacob Sasportas to R. Joshua de Silva of London (responsa "Ohel Ya'aḳob," No. 66). He was also one of those who shared in the enthusiasm for Shabbethai Ẓebi which filled all the Jews of Amsterdam; and he was the first to sign the eulogy which prominent members of the Portuguese community of that city addressed to that pseudo-Messiah in 1666, not knowing that Ẓebi had already embraced Islam. Mussafia's first work, the "Zeker Rab," proved to be his most popular one. He recounts therein the history of the Creation in such a way that all the Hebrew roots of the Bible and most of their derivatives occur but once. This ingenious aid to a lexicographical knowledge of the Hebrew vocabulary has passed through many editions and revisions, including a Karaite adaptation (comp. the list of editions in Steinschneider, "Bibliographisches Handbuch," pp. 98 et seq., and in Benjacob, "Oẓar ha-Sefarim," p. 156, to which must be added the edition by Willheimer, Prague, 1868). The additions to the "'Aruk," a large number of which are based on the lexicon of Buxtorf, although they contain much original matter, have been retained as a component part of the later editions, and they are specially indicated by Kohut in his "Aruch Completum." On the value of them see Rapoport, "Biographie des R. Nathan," p. 13 and notes 68, 69; Kohut, l.c. Introduction, pp. xlvi., lv. ; Krauss, "Lehnwörter," i., p. xxxvii. Some sections of the "Zeker Rab" have been published in German by Fr. Delitzsch and Julius Fürst ("Orient, Lit." i., ii.). A commentary on Yerushalmi ascribed to Mussafia is mentioned by Michael. Michael, Or ha-Ḥayyim, pp. 284 et seq.